BROWNSVILLE, Texas—The Port of Brownsville presented West Plains LLC with its 2018 Chairman’s Award in recognition of the company’s investments and rehabilitation efforts of the port’s iconic grain elevator. Brownsville Navigation District Chairman John Reed presented the award to West Plains CEO Amit Bhandari at the port’s annual customer appreciation luncheon, Dec. 4. The event was attended by nearly 200 guests, including local, regional and state public officials, port tenants, community and regional business leaders. West Plains entered into an agreement with the port in 2016 to restore and operate the grain elevator, with capacity to store three million bushels of grain. Since restoration efforts began, West Plains has invested $7 million in its facility, with plans for another $9 million in 2019. The company projects its railcar volumes to exceed 3,000 loads by the end of 2018. So far this year, it has handled more than 300,000 metric tons of grains, including yellow corn, dried distillers grain, milo, and sugar. West Plains currently employs 22 people and utilizes about 200 truckers to regularly move its products. As part of the company’s Phase 2, it is partnering with the port to rehabilitate the bulk cargo dock in front of the grain elevator, making its facility marine export capable. The Chairman’s Award is an annual award highlighting the achievements of port tenants in the areas of business growth, leadership, job creation, customer service, innovation, safety, and community involvement. 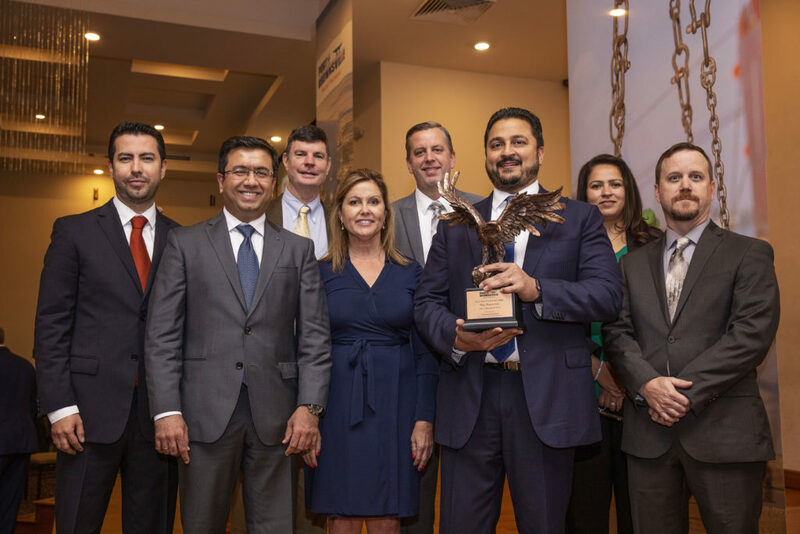 The 2017 winner was International Shipbreaking Ltd.
Amit Bhandari, CEO of West Plains LLC (third from right), is pictured with the Chairman’s Award along with company representatives present during the event held Dec. 4, 2018.